Tomatoville® Gardening Forums Index > What Else Do You Grow? > Potatoes > Lowdown on Sweet Potatoes. While on a fruitless search to compare sweet potato leaves with varieties I ran across a good site for you folks up north on growing sweet potatoes. It is very informative by a guy I highly respect. Glenn Drowns of Sand Hill preservation. Other than me ramble on I will send you directly to his information on how he managed to grow them in places we were all told you cant. If you haven't been to his site before it is a clean site with no pop ups and animated garbage to slow your computer down. Good ideas in there. I have been wondering how I will start my slips from potatoes from last year. I tried using a chicken incubator on low last year but they all rotted. I only got slips from the ones I did in the glass of water with toothpicks that we learned in school. I think I will use the trench and tent of plastic or a homemade cold frame. We have lots of old windows in the barn that were here when we bought our farm so I'd like to do the cold frame thing anyway. Thanks Worth! 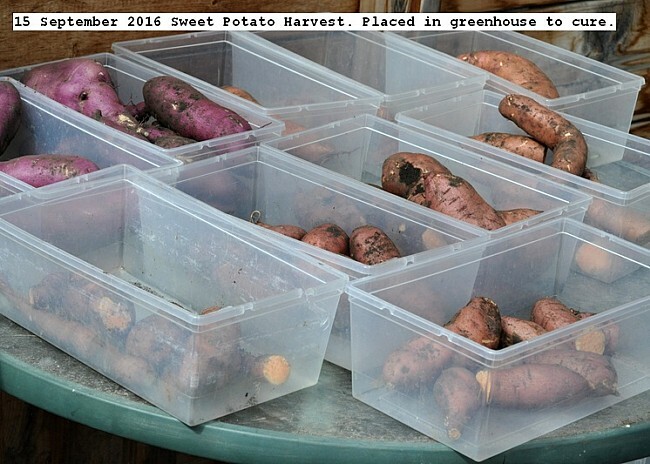 Glenn's site is a trove of useful information on many crops including sweet potatoes. I've had good luck with sweets here in SE PA. They are of the few plants that really like the hot and humid months! Thanks guys where I live they are about as easy to grow as falling off a log. I put it up for the folks like some of you all that live up north. As for my slips I am growing I just stuck the end of the sweet potato in a container of soil and let it be. After awhile the sweet potato sprouts roots but long after the slips started sprouting. Thanks for this link. I tried SPs from a grocery store 'tater last year, and they rooted but formed no slips, probably because they were sprayed with something. This year, I finally found organic SPs, but it was already mid-May. I was worried it would be way too late. I planted the slips in mid June. That guy seems to be reassuring me that they'll be fine, it's better than planting them too early. They've grown quite well so far, totally loving our hot and humid summer. Can't wait to see if I'll get any taters when it's time to dig them up. Glenn is an absolute master at what he does for sure and the reason I used him here. I dont try to root the potatoes and just put them in a dark place in the house soon they will start putting out eyes. This is when I plant them in the soil. I tried the jar of glass and found it to be a waste of time. The plant in the pictuer is still going strong and outside with vines growing from it. Only because the deer haven found it. Very interesting Worth, thanks for posting. Useful advice for those of us with slightly shorter but hot summers. My ten sweet potato plants were harvested. 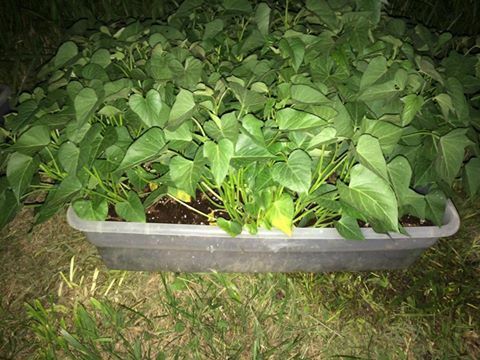 This is my first attempt at growing sweet potatoes under reasonable conditions. Eight of the plants were from slips purchased from a site on the internet. Two purple ones were from slips from a supermarket grown by myself. The supermarket slips were longer growing hence accounts for their larger production. The total weight was 31.5 pounds from ten plants or an average of 3.15 pounds per plant. With good growing conditions extrapolating my results an expectation from each plant would be about 6 pounds in a home garden. All the new tubers were centered around the planted slip in a diameter of about 12 inches. The vegetation covered a very large area and was very healthy. It was removed before digging the tubers. Some of the tubers were disfigured by an insect or rodent. This was simply cut away. The tubers were placed in a hot greenhouse and will be allowed to cure or condition for about ten days, then stored in my root cellar. One tuber was baked and is shown with these pictures. It was most pleasant to eat. I've read that link a few times and he knows what he's doing. 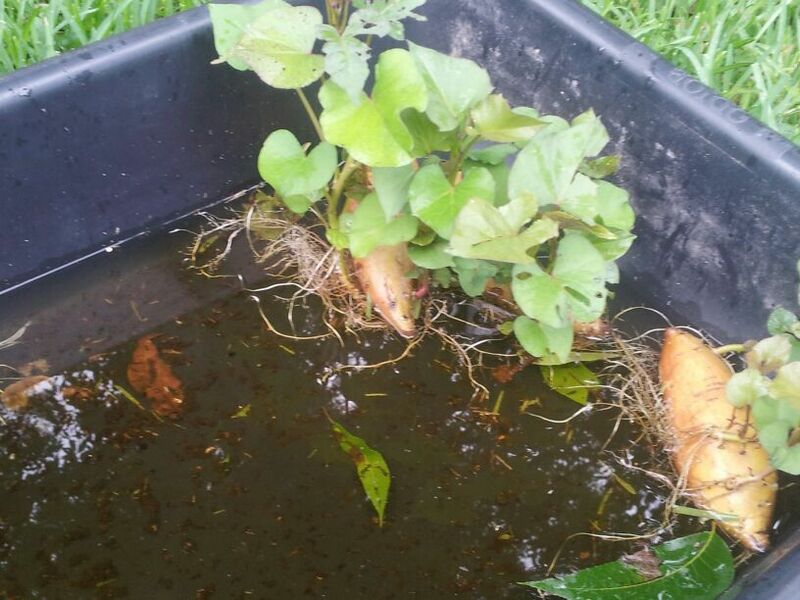 I tried something new last year and it worked great, keep them inside till they start sprouting and then set them in a pan of shallow water and they will grow. Similar to the jar method. You can also plant the potatoes whole in a tub of potting soil and then start clipping off slips as they grow. Glenn's information and knowledge is exceptional. I have grown sweet potatoes from Sand Hill several times. I remember another sweet potato seller from Oklahoma...I think Duck Creek Farms. He seemed to have pretty good knowledge and a nice variety as well. Is this place still in business? I like to support Sand Hill and Glenn's hard work as much as I can. My family has always grown Beauregard. There is a new variety called Covington. It is patented and quite expensive, but it is resistant to nematodes and fusarium wilt. I've ordered slips from Sandhill and Duck Creek in the past. This year I grew my own slips from saved potatoes. I cut the potatoes, put them in water and once the sprouts developed, I pulled the sprouts, which I then later planted. I also ordered tubers of Orleans, a variety from Fedco said to be as good or better than Beauregard. I the planted them, cutting off slips from the vines and later planting them. Seems like these are both methods Worth and some others have used. By the way, we have grown Beauregard, but we can say that Orleans yielded a great crop of sweet potatoes for us. Nice haul Durgan. If you can get a good crop like that in your climate I should be able to also. I started slips from sweet potatoes purchased at the local organic grocery. That year I also bought named variety sweet potato plants from a garden center. I got nothing but leaves. Not sure what I am doing wrong. My climate is tricky (the ground is warm by June but the season is only medium long) The market had locally grown sweet potatoes that were the size of a basketball just before Thanksgiving. Were they hoop house grown?